Green Tea X50 by Tribeca Health is a potent antioxidant and instant green tea energy drink. Green Tea X50 is a natural energy drink and thermogenic fat burner that helps energise, revitalise, detox and assists with weight loss. With a convenient and easy to use sachet the Green Tea X50 is great as a pre-workout or intra-workout boost or just as an all-round healthy drink! 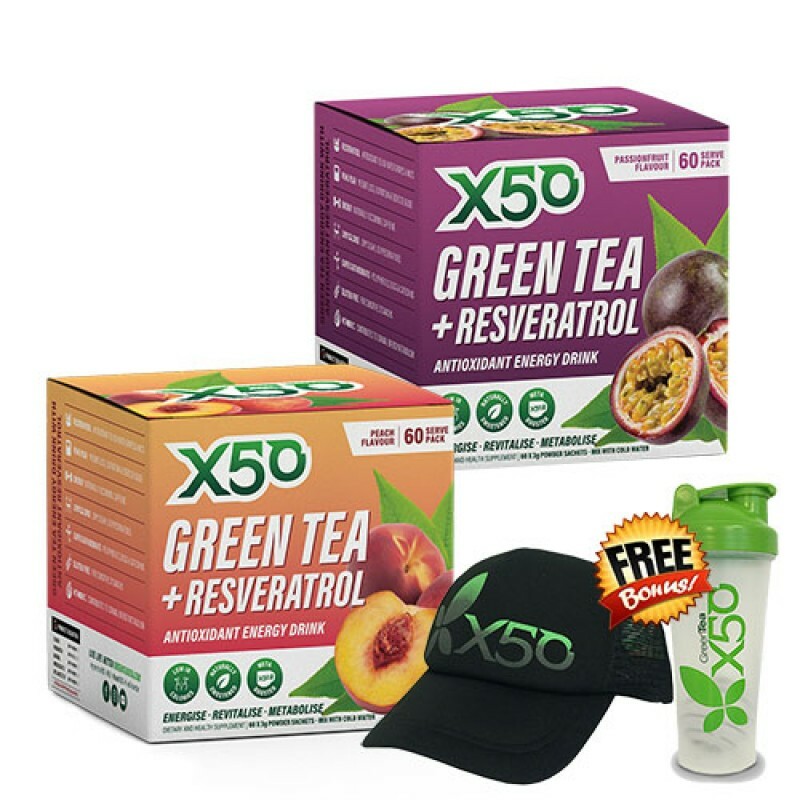 Green Tea X50 is the ultimate antioxidant drink, specifically designed to optimise the health benefits of green tea polyphenols and catechins, particularly ECGC, and Resveratrol for maximum health benefits. Each serve of Green Tea X50 is the equivalent of 20 cups of regular green tea and contains the resveretrol equivalent of 25 glasses of red wine. Tribeca Health Green Tea X50 may increase metabolism and assist fat burning due to its thermogenic properties. 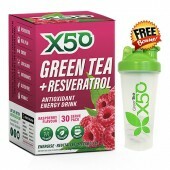 Green Tea X50 is diabetic friendly, contains no sugar, caffeine or guarana. Take Green Tea X50 once a day for good health and twice daily for the antioxidant, detoxing, thermogenic fat burning and weight loss benefits found in 40 cups of regualr green tea. Simpy add 1 sachet to 600ml water, shake and drink. Delicious hot or cold. 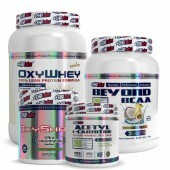 Contains potent antioxidant ECGC to promote weight loss by inceasing energy expenditure. Fights the damaging effects of free radicals and works to scavenger free radicals. Resveratrol (Fallopia Japonica): Reseveratrol is a type of antioxidant that is commonly found in the skin of fruits like grapes, berries and nuts. It is also present in high concentration in red wine. Many studies show that resveratrol is an important phytonutrient (plant chemical that helps to reduce inflammation, prevent free radical damage and offer protection against cancers. 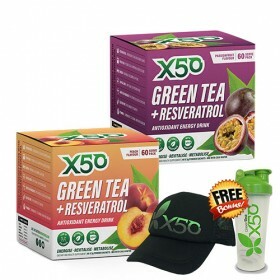 Each sachet of Green teaX50 contains the equivalent of resveratrol present in 25 glasses of wine. L-Theanine: It is an aminoacid that occurs naturally in green tea leaves. Theanine is known for its ability to improve mental alertness, clarity and focus. Many studies attribute tea's ability to relax and rejuvnate to the presence of theanine. EGCG: Epigallactocatechin Gallate is in short called EGCG. EGCG is a polyphenolic compound that is responsible for the powerful antioxidant effect of green tea and its fat-burning ability. Some studies show that EGCG helps to initiate the thermogenesis (fat-burning ability) of the body and help as a natural aid in weight loss. Trace minerals: Greentea X-50 contain trace minerals that are essential for maintaining water balance and health. Trace minerals play a crucial role in enhancing immune health, energy and metabolism.